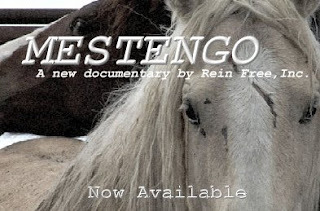 "Mestengo", a newly released documentary on the current plight of the American Mustang is now available on DVD. The producers, Rein Free Inc., are encouraging everyone to view this work during this critical time for America's wild horses and burros. There is also the Mestengo website, which includes links, a petition and a host of ideas about what each of us can do to let the horses voice be heard before its too late! WE ALL NEED TO BE VOICES FOR THE MUSTANGS!!! Hi – Will you please post a link to your Blog at The Mustang Horse Community? Our members will love it. It's easy to do, just cut and paste the link and it automatically links back to your website… it’s a win win. You can also add Photos, Videos and Classifieds if you like. It’s free and easy.